May 5th - May 11th, 2019 - Space Available! Andy will be leading a night photography workshop to capture the stunning beauty of the Milky Way above two premier, dark sky parks. 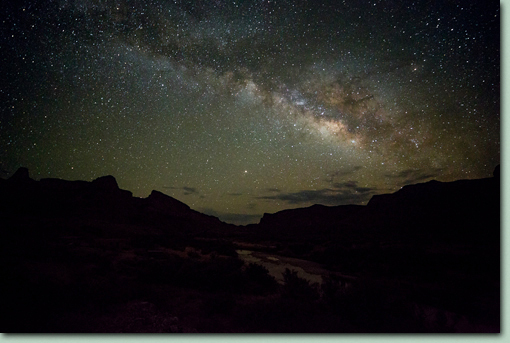 Join us at night, as we photograph iconic southwest landscapes within Big Bend National Park and Big Bend Ranch State Park while the Milky Way dances overhead. 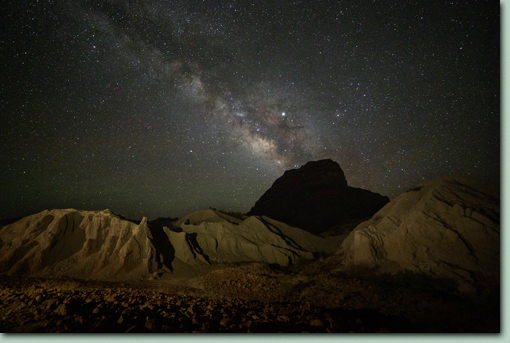 This night workshop is geared for the intermediate to advanced photographer. However, beginners with a working knowledge of their camera can gain a lot of experience and instruction. Each participant is assisted at their level. We focus on helping participants create the most appealing compositions of each location we visit. This is a workshop environment, the instructor is present to aid in the field and teach his techniques for night landscape photography. If you're an advanced photographer, he is happy to help or stay out of the way. This night, photo workshop is geared to single still captures and sequential, multiple still captures used to create time lapse videos. Andy will provide post processing instruction for turning a sequence of images into a time lapse video using Photoshop. The workshop starts on Sunday, May 5th, 2019 at 3:00 PM with an introduction and discussion in the hotel's conference room. Afterward, we will photograph at sunset and into the stars. The formal workshop ends after photographing late on Friday night / early Saturday morning (May 11, 2019). On most nights participants can expect to leave the hotel in time to capture a sunset (about 8:30 PM) and we'll stay out until we've finished which is usually between 2:00 AM and 3:00 AM. Then we return to the hotel for sleep. About 11:30 AM we will eat a meal. After eating we may spend time with night sky post processing instruction/aid using Adobe Photoshop. Then we will have another break before it's time for more photography. Sunset photography is scheduled on 4 nights, some picnic dinners will be required. COST: $1,490.00 per participant. (Discounted $100 for 1st run.) Maximum number of participants is 8. This workshop does involve some hiking and elevation gain to arrive at certain shooting locations, while other shooting locations will be just beyond the parking lot. The elevation range of our photography locations is 3,000 to 6,000 ft. The trail hiking may be deemed vigorous activity or light activity based upon one's condition. Trail hiking surfaces and those beyond the parking lot are generally uneven, ankle high hiking boots are recommended. Our longest trail is about 1/2 mile each way. One doesn't have to be in tip-top shape, but one's enjoyment will be enhanced by good health and preparation. Participants should consult with their doctor before attending our workshop or venturing to higher elevations. Proper hydration is a must. Without it one will lose strength, energy and may develop a headache. We will provide bottled water in the field. Be prepared for possible temperature extremes and sudden changes in weather. Be aware that night in the desert may be chilly. Please bring a flashlight. We will provide packaged snacks to eat while in the field. 1st Hotel - May 5th, 2019 (Check-in) - May 8th, 2019 (Check-out): Lajitas Golf Resort, Lajitas, TX 79852 Phone # 432-424-5000. We have a group reservation here, please only book by calling the lodge. Please indicate that you are taking one of Rocky Mountain Reflections Photography's rooms. the dates 5th - 8th, and provide your payment information. We have reserved a set of their most affordable rooms on the 2nd floor, no elevator. Should a more elaborate room be desired, they are happy to offer room upgrades for an additional fee. 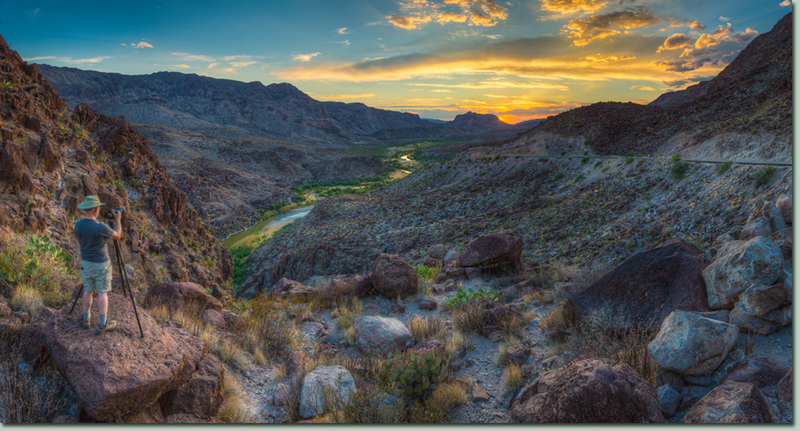 2nd Hotel - May 8th, 2019 (Check-in) - May 11th, 2019 (Checkout): Chisos Mountain Lodge, Big Bend National Park, TX. Phone # 432-477-2291. We have a group reservation here, please only book by calling the lodge. Please indicate that you are taking one of Rocky Mountain Reflections Photography's rooms, the dates, 8th - 11th, and provide your payment information. TRANSPORTATION: Most people flying to this workshop will find flying into El Paso, TX (about 5 hours) or Odessa / Midland, TX (about 4 hours) to be the best choices. Generally, a newer camera will have better high ISO performance than an older camera, so if you've been thinking about a new camera, it may make sense to buy it before this workshop. One should shoot with a sturdy outdoor tripod that can adjust from standing height, without cranking up a center post, to very close to the ground. This type of tripod does not have attachments connecting the legs to the center post; i.e. the legs can move independently. Unless your camera has a built-in level, we recommend having a 2 axis flash shoe bubble level, it is the easiest way to make sure photos are level. Please buy these at a reputable dealer; they run about $35.00. To obtain post processing aid please bring a laptop with Photoshop installed. 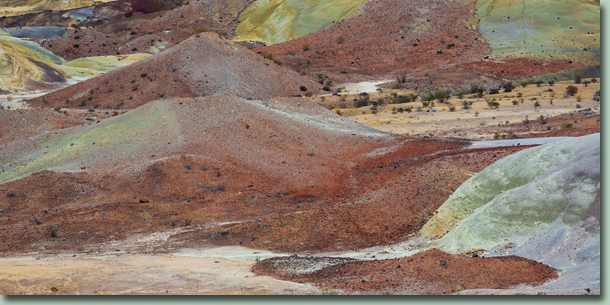 We recommend having a polarizing filter to use with some of the photographs on this workshop. Andy combines images of various exposures in post processing. Andy will be happy to teach participants his field and post processing techniques for doing so (requires a cable release with some cameras). A lens range from 17 mm to 400 mm after the lens multiplication factor is recommended. However, we think participants should bring their entire range of lenses. We do not guarantee the weather. Workshop fee does not include transportation, lodging or meals. Maximum number of participants is 8. We require an acknowledgment of risks be signed before going into the field. We will send the acknowledgment of risks upon registration, please return it at the start of the workshop. In the event Rocky Mountain Reflections Photography, Inc. (RMRPI) cancels a workshop due to unforeseen circumstances such as inability to obtain permits, instructor injury, death… Then, RMRPI will refund fees collected by RMRPI for the affected workshop. In the event of a natural disaster, government closure or other happening of this nature that causes a workshop to be canceled, RMRPI may be unable to refund workshop fees. If this happens then funds collected by RMRPI will be applied as credit toward a future workshop of the participant’s choosing. RMRPI will not be held responsible for other expenses (airline tickets, hotel deposits, rental car…) that may be associated with any canceled workshop. We will be walking in areas where sharp thorns and needles may be present. We highly recommend tough, leather, ankle high, hiking boots and tough, puncture resistant gators to protect one's calves. Also bring a strong flash light to illuminate the path when walking at night. It can be quite warm (some might call it hot) during the day so bring light, cool clothing, Andy will wear shorts during much of this workshop. It's likely to be comfortable at night, but bring a fleece just in case. To keep nighttime crawling things out of camera bags we recommend they stay off the ground. It may be best to carry the camera attached to the tripod and bring a fanny pack with an extra lens, spare batteries, memory cards, cable release, snacks and water. *Print or download to field digital device: Night Photography Rule of 400. Rocky Mountain Reflections Photography, Inc. is authorized by the National Park Service, U.S. Department of the Interior, to conduct services in Big Bend National Park.